Our 9th vintage trailer restoration project has been underway for several months. This project will be the first vintage trailer to go on our on-site vintage trailer park. RESTORATION COMPLETE - Now Available For Rent! Master - Queen bed and TV with privacy door. Roof A/C in master. ​Twin bed with lighted vanity. Full bath with original cast iron tub. Hair dryer. Refrigerator with freezer. Dixie stove - Four burner propane with oven. Kourig coffee maker with vintage coffee grinder. Microwave. Blender. Kitchen Aid mixer. Games and lava lamp. Click Clack sofa unfolds into extra bed. Reading lights. Abundant storage. Deck and picnic table. Chiminea and BBQ pit. Beautiful outdoors. Just outside of Bandera (Between Pipe Creek and Bandera). Next door to award-winning Backyard Bistro. 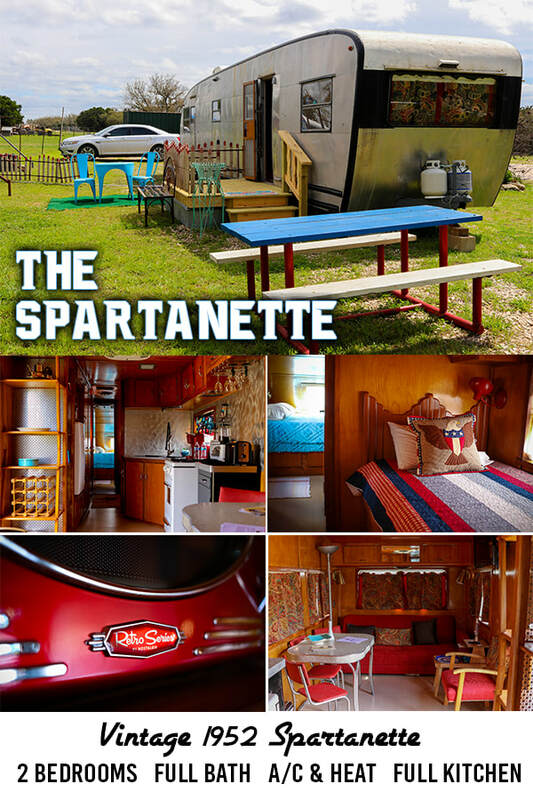 Restored on sight, the Spartanette is 44 feet of vintage retro in every detail with 2 beds, full bath, full kitchen, AC/Heat - complete with your own yard area. Right next door to the Backyard Bistro, and just outside of Bandera, it's a great location to unwind after a long day in the Hill Country. Two and four legged children welcome in both log cabins.